Since all animals need water to live so it’s important that you provide your horses with a clean source of drinking water to maintain their health and survival. While this may sound like a trivial task, you will need to consider a few things prior to purchasing a horse bucket. For example, horses are large animals and the bucket will need to be big enough to hold a large capacity water. You’ll also want to make sure that it’s sturdy so it won’t easily get knocked down. But these are just a few features to look for. Providing fresh clean water is important for the well-being of your horse, and the right pail or bucket can make a big difference. Our regular updates ensures that our readers have access to the best product today! If you live in a northern climate, then you will need to make sure that the water in the bucket does not freeze in the winter time. In such cases, you may need to look for a heated water bucket that will help to keep the water from freezing on your horse. There may even be situations where you need to carry from its source to the horse in which case you need a bucket with a strong handle. Your needs may vary which is why you should take a look at the best horse buckets to make sure that you get on that works for you! Collapsible buckets can really come in handy for when you are on the go. For example, you can easily store such a bucket in a horse trailer or pack it with you when you are trail riding. 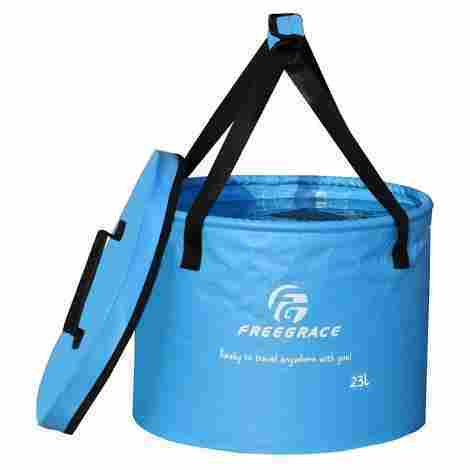 The Freegrace Premium Collapsible is a great choice for when you need a highly portable horse water bucket to take along with you. One of the challenges of carrying water in a bucket is that the water may splash as you move around. This bucket has a lid that will help make sure this doesn't happen. You can fold this bucket down into a fraction of its size which makes it easy to store and take with you while you are traveling or even around the barn. You will see this bucket sold at a price that is slightly lower than the average price for a horse water bucket which makes it into an affordable option for a water bucket. You can purchase this bucket in different sizes and capacities to get the right size. It has a lid that keeps the water inside of the bucket. There is a comfortable handle that you use to carry the bucket. It supports itself so you won't need to worry about it collapsing on its own. The bucket collapses to a fraction of its original size when stored. The bucket is heavier than what many people expected it to be. It is not UV resistant and will break down if exposed to too much light. Sometimes you need a bucket that you can rest against a wall or some other structure for stability. This is a great bucket for such a use case thanks to its flat back that will like you put it tight against a flat surface. 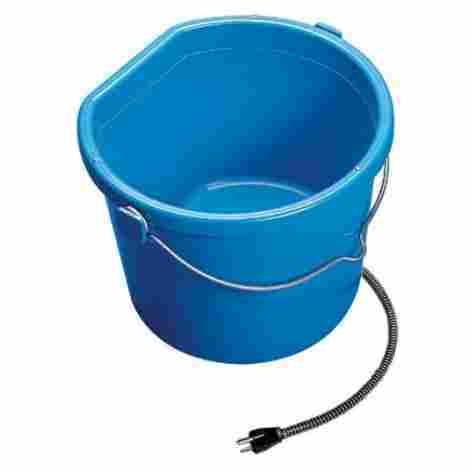 You can easily fill this bucket without a hose since you can rest it against a wall. The bucket has a flat back design which allows you to put it tight against a wall. This can be great if your water faucet is tight against a wall or another obstacle. 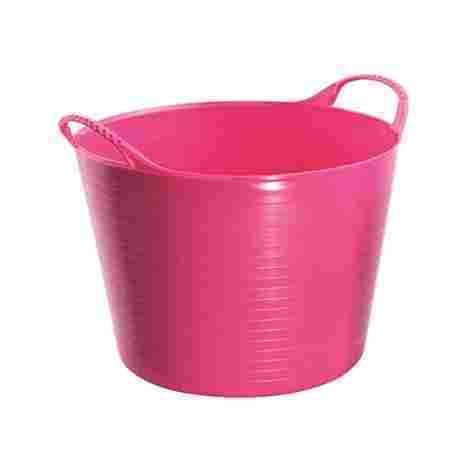 The bucket is made from a heavy duty plastic material. This allows the bucket to be both strong and lightweight at the same time which makes it great for farm use. You will see this bucket sold at a price that is lower than the average price for a horse water bucket which makes it into a bargain purchase since you don't need to spend much on it. It has a twenty-quart capacity that allows you to carry lots of water. It has been manufactured in the United States of America. You can purchase the bucket in ten different colors should you need different colors. The plastic construction makes it lightweight and easy to carry around. Heavy-duty plastic helps to prevent breakage from impacts and dropping. The bucket is missing a pouring lip which makes it hard to pour water. It is large and may be hard to fit into normal sized cabinets. People who live in colder climates may need to make sure that their horse's water doesn't freeze on them in the winter time. A heated bucket, such as this one made by Applied Precision Industries, is a great choice because it will keep the water from reaching freezing temperatures. This will keep ice from forming so that your horse can access water. The bucket has a heating element so that you can keep water from freezing. The product has been tested at temperatures that are as low as 20 degrees below zero so you can trust that your horse will have water. It has a cord that is six feet long and is protected so that the animal does not chew through the cord. This allows you to easily reach a power outlet. You will have to plan on spending more than the average price for this bucket. This is because it has electrical heating components that will keep your horse's water from freezing. The bucket has a flat back so that you can use it in a stall. There is a six-foot cord that allows you to reach power. It can keep water from freezing up to 20 below zero. There is a metal handle that you can use to carry it. The cord is wrapped to keep animals from chewing through it. Some users have reported cracks developing in the bottom of the bucket. Other users have experienced the heating element failing after only one season. The Friendly Swede makes a collapsible bucket which is a great choice for when you are traveling or need something small to put in your horse trailer. The bucket offers great features such as a lid as well as a mesh pouch on the side where you can store small accessories with you as well making the bucket even more useful. There is a mesh pouch on the side of the bucket where you are free to store items that you may need to take care of your horse such as brushes or salt licks. The plastic used to make the bucket is free from BPA so you will not need to worry about the water stored in the bucket to be unsafe for your horse to drink. 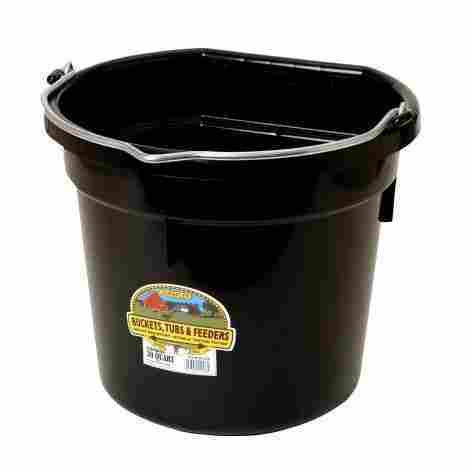 This bucket is sold at a price that is around the average price for a horse water bucket which makes it into an excellent purchase for your barn or horse trailer. There a handle on the bottom of the bucket to make it easy to pour. It collapses down to a fraction of its original size for easy storage. There is a mesh pouch on the size of the bucket. The bucket has a lid to keep water from splashing out of it. The plastic does not contain BPA and Phthalate so its safe. Some users have reported that the bucket has a chemical smell to it. The bucket is not stable when its filled with water and starts to collapse. Tubtrugs are a great horse water bucket to have around the farm because it has been designed to be in both summer and winter weather. You will not need to worry about this bucket breaking down when it sits out in the sunlight or gets exposed to harsh winter weather. The bucket is strong and long lasting which makes it great for watering horses. Tubtrugs are made of a plastic that does not break down when it has been exposed to UV radiation from sunlight or getting exposed to frost in the winter months. This bucket is made of a food grade plastic which makes it great for when you need to carry food or water to your horse since the plastic won't contaminate the contents of the bucket. You will see this bucket sold at an average price which is another great reason for you to use it for watering your horses since you won't have to spend too much on it. The plastic used to make the bucket resists frost and UV radiation. The handles are strong and allow you to carry heavy loads. It has a 14-liter capacity making it great for watering horses. The bucket has food grade plastic that won't contaminate drinking water. It is flexible and unlikely to break on impact when its dropped. Some reviewers have reported that the bucket is not very durable. The bucket is not very wide on the bottom which can be a problem. Miller Little Giant Farm makes a plain bucket that holds eight quarts of water and has a handle. This is the perfect bucket to use when you need to bring water directly to your horse since it is large enough for the horse to drink out of it but isn't so large that it will become too heavy to carry when it's full. There may be times when you lose your balance and drop your bucket on the ground when its full or the horse may knock it over. Either way, this bucket is strong and flexible enough to resist such accidents. There is a carrying handle on the bucket that is made of metal which you can use to carry the bucket from one location to another. It's strong enough to carry the bucket when it's full of water. You will see this bucket sold at a price that is lower than the average price for a horse water bucket which makes it into a bargain buy for your barn. You can put eight quarts of water in this bucket. The bucket is made of polyethylene resin which makes it strong and light. It is able to resist breaking from impacts making it durable. The material has been designed to not warp from heat. There are paper labels on the bucket that are sticky and hard to take off. It's only suitable for small tasks such as watering a single horse. Stainless steel is the way to go if you require a heavy duty horse water bucket that will resist breaking, rusting, and corroding. Metal buckets are best for whenever you need something that is heavy duty and long lasting which is why Advance Pet Products offers this round bucket. You can easily use this bucket to water horses as well as other livestock. The bucket is made of stainless steel which is great for farm use because it is strong and durable. Stainless steel is also heavy and is less like to tip over. The bucket is safe to use in the dishwasher which makes that it can be washed and sanitized as needed. This makes it great for when you need to make sure your horses have clean water. You will see this bucket sold at a price that is well above the average price for a horse water bucket due to the fact that it is made of high-quality stainless steel. You can purchase this bucket in a variety of different sizes. It is made of stainless steel so it is long lasting and durable. The bucket can be washed and sanitized in the dishwasher. There is a carrying handle so you can use it to carry water. You can plan on this bucket lasting for a long time. Some users have reported that the bucket does develop rust in welded areas. The steel is not very heavy gauge which can make it feel flimsy. Sometimes a traditional bucket isn't ideal for watering horses because they are prone to get knocked over by the horse. Miller Co makes a feed pan that you can use the water your horses that is wide on the bottom and therefore less likely to get knocked over by the horse. This is a great choice for pens and horse stalls. The bucket is pan shaped so it is wider rather than taller. This makes the bucket less likely to get knocked over by the horse while they are drinking out of it. 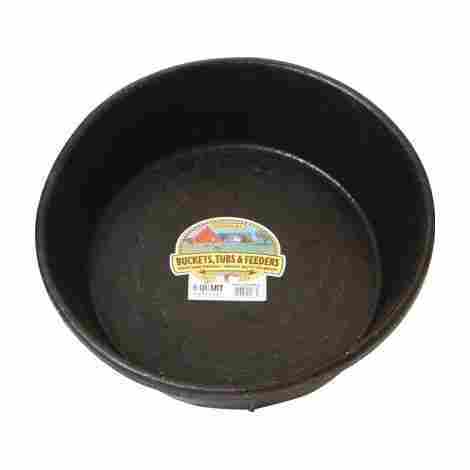 The bucket is made of a high-quality rubber material that is durable and long-lasting. Rubber is heavier and less likely to move around while the horse is drinking from it. You will see this product sold at a price that is much lower than the average price for a horse water bucket which makes it into a great value for the money. It is made of rubber that is unlikely to slide around. The pan shape helps to keep it from getting knocked over by the horse. This product is highly ideal for pens, stalls, and cages. It can be used for water or you can put feed in it. The bucket has a two-gallon capacity so you can put enough water in it. It isn't ideal for carrying water from one location to another. The product has a strong smell that takes a while to go away. Sometimes it is easier on your horses when they don't need to lean all of the way down to drink their water. This waters can be attached at any height by using lag bolts or other similar hardware which makes it a great horse water bucket to put into a stall or other location allowing your horses to drink easier and keep the water clean. The bucket is made of galvanized steel metal which resists corrosion and rusts and helps it to last for long periods of time without leaking, corroding, or getting dented. Water buckets that are placed on the ground can get dirt and straw in the horses drinking water which can make the horses sick. This water bucket can be installed at any height to help the water stay clean. You will see this product that is sold at a price that is much higher than the average price due to it being made of galvanized steel which is long lasting. The waterer can be used for horses, cattle, and other livestock. It is made of a heavy gauge, galvanized stainless steel metal. You can install this waterer at any height using lag bolts. It can fit a 1/2 inch hose or a pipe. It works with water sources up to 50 psi. Some reviewers have experienced the waterer developing rust after only a few months. It can be hard to find hoses and adapters that work with this waterer. Qt Dog makes a stainless steel bucket that has a flat side with hooks. 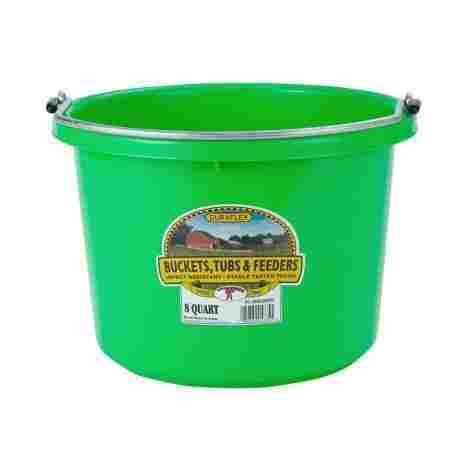 This is a great bucket to use around the barnyard because you can easily carry water and then hook the bucket to a stall which will keep it from getting knocked over when the horse drinks from it. The fact that it is stainless steel will mean that it is long lasting. There is a pair of hooks on the flat side of the bucket which you can use to hook the bucket to the horse stall, fence, or some other surface. This bucket is safe for the dishwasher which means that you can wash and sanitize this bucket when you need to make sure that the horses have clean drinking water. You will see this bucket sold at a price that is around the average price for a horse water bucket which turns it into an excellent value since you get a high-quality product without spending much. 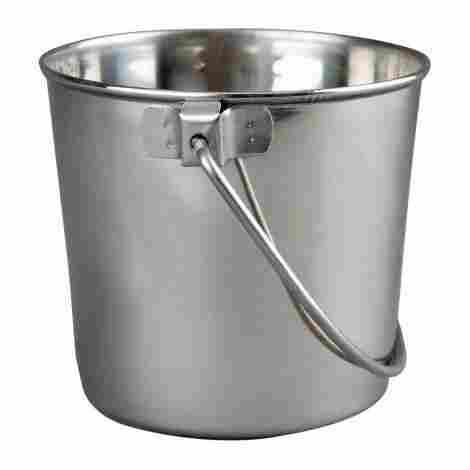 The bucket is made of a stainless steel that is high quality. It can be washed and sanitized in a dishwasher to clean it. There are hooks on the side of the bucket. You can use this bucket for water as well as food. Some users have noticed that the bucket still develops rust in it. Other users have had to wipe out the bucket on a daily basis. Horse water buckets come in different shapes and sizes which means that you have plenty of choices when it comes to picking out choices for your barnyard. Some buckets are perfect for carrying water to a drinking trough while other buckets are more suitable for a horse stall. You can even find buckets that are perfect for keeping in a horse trailer or for when you are trail riding. There are more than enough options when it comes to picking out a horse bucket and many of them are low cost so that you can get multiple choices to pick from. No matter what, it is critical that you have the tools that you need to ensure that your horses have plenty of water. Without enough clean drinking water, your horse will get dehydrated and will eventually get sick. This can even happen in the winter time as well so it is important that you provide your horses with drinking water. A high-quality water bucket will make sure that your horse has access to enough clean water. You should always be on the lookout for buckets that are large enough for the horse to drink from without spilling the water. Horse drinking buckets come in a few different materials so you will want to think about what sort of material you will want to make sure you get the bucket that is right for your needs. Many buckets are made of a strong plastic material. Plastic is a great choice because it does not corrode or develop rust which can help keep the water cleaner. It also allows the buckets to be lightweight so that it is easy to carry water to your horse as needed. Of course, plastic can break and since it is lightweight, it is easy for the horse to knock it over and spill the water out of the bucket. Metal is the other common material that is used to make horse water buckets and is a widely popular choice. One of the main advantages that metal has over rubber is that it is more durable and is less likely to break than plastic. You can also get metal buckets in different thicknesses which means that they are not necessarily heavier than plastic buckets are either. However, metal can be prone to developing corrosion, including rust, which can contaminate your horse’s water and make the water unsafe to drink. If you are looking at purchasing a metal horse water bucket, then you should consider looking stainless or galvanized steel to help it last longer. The final choice is rubber, although rubber tends to be used in more pan style buckets rather than buckets that you carry. Rubber doesn’t rust or corrode and it is durable as well. Another advantage of rubber is that it is less likely to slide around as the horse drinks from it. Unfortunately, it is unlikely that you will find a handled bucket make of rubber so your options are limited. 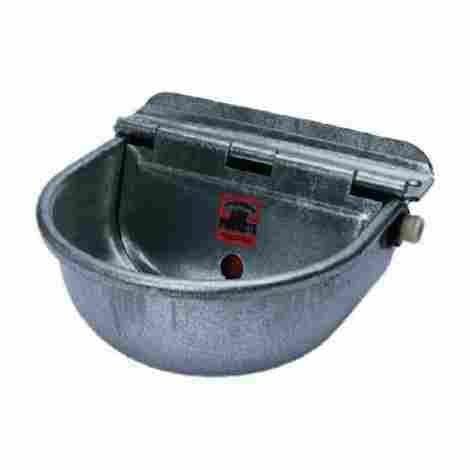 Horse buckets are sold in unheated and heated versions which will provide you with some more choices. A heated bucket is useful in climates where you will experience below freezing temperatures and your horse’s water can freeze during the cold season. Its main advantage is that it has a heating element built into the bucket that will warm the water and prevent it from freezing over when it is cold outside. This will help to make sure that your horse can still access its water even when the outside temperature is below freezing in the winter season. Of course, most of the time you will not need a heated horse bucket because it won’t be below freezing. A heated horse bucket costs more than a regular horse bucket because you are adding a heating element and a cord into the bucket. It is also possible for the heating element in a heated bucket to fail which will make the heated horse bucket into a regular horse bucket. You will also need to make sure there are no fire hazards near a heated horse bucket in case something goes wrong with the heating element or the cord. For these reasons, you should only spend the extra money on a heated horse bucket when you actually need to have a heated bucket. If you live in climates where the temperature can get below freezing and there is a chance that your horse’s water can turn into ice, then you will need to have a heated horse water bucket. Otherwise, you should save yourself some money and stick with a regular horse water bucket that is not heated since there is no real reason to have a heated horse bucket. Size and weight matter because it will determine how much water you can put into the horse bucket and how likely it is that the bucket will tip over when the horse is drinking out of it. A larger horse bucket can naturally hold more water than a smaller one, but this will mean that you will have to work harder to carry the bucket if you need to move a full bucket from one location to another when its full of water. On the other hand, a smaller bucket is easier to carry but will need to be refilled more often because of its size. There is also the matter of how often you should change the water in the bucket. Since a large bucket holds more water, you may be tempted to not change the water as frequently as you should. Horses are not clean animals and they will get dirt, spit, and straw into their drinking water which will introduce germs into the water and make them sick. A smaller bucket will force you to change the water on a more regular basis since you will need to keep refilling it more often anyway. On the other hand, a larger bucket will mean that you will need to check the water for cleanliness anyway. If you want to use a single bucket to water multiple horses, then it is recommended that you purchase a larger horse watering bucket. In situations where you are only watering one horse at a time, then you will probably be better off using a smaller water bucket since it is easier to carry than a large bucket. If your horse is messy and likes to kick over their water bucket, then you can also use a larger and heavier bucket. All animals are careless with their water at certain times and are likely to accidentally or deliberately spill their water bucket. This is a good reason why you will want to look at the bucket to see what sort of things it has to avoid spilling water. The more likely your water bucket is resistant to falling over and spilling, the longer your horse will have access to water. You can look at the size, shape, and features of the bucket to get an idea as to how likely it is to avoid getting tipped over and spilled by the horse or other livestock. 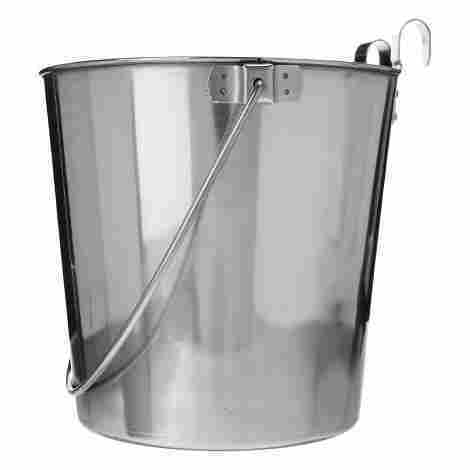 Some buckets are a pan style where they are wider than what they are taller. These are great to use when you are concerned about the water spilling because such buckets have a lower center of gravity and are therefore less likely to get tipped or knocked over accidentally by the horse. Many rubber pan style buckets feature this design and work great for horse stalls or similar applications. You can also look for buckets that have a flat back on them. A flat back will allow you to put a bucket firmly against a wall or a pole in the barn. Many people have some sort of a tie down they use on the bucket to secure it firmly to the wall so that the horse doesn’t knock it over when it is in place. You will also see raised buckets that have hooks or mount off of the ground. Not only does this design help to keep the bucket in place but it will also help the water to stay clean while it is in the bucket since it is raised from the ground. The overall quality should also matter to you when you are picking out a water bucket for your horses. There are going to be more than a few times where you end up dropping your bucket or knocking it over by accident. Even if you can carry your bucket perfectly, chances are that your horse will at sometime knock the bucket over, step on it, or even kick it. Your bucket needs to be strong enough to not develop dents, cracks, or leaks in it when it happens. If you plan on carrying a bucket by its handles, then you will also need to make sure that the handles are strong and durable so that the bucket is supported while it is under a heavy load. When you are picking out a bucket, you will need to make sure that the walls of the bucket are strong and thick. This will be different depending on the material that is used to make the bucket so a plastic bucket will normally need thicker walls than a steel bucket. You will need to make sure that the bucket is sealed completely and doesn’t leak water as a leaking bucket will make a mess and doesn’t really serve its intended function. When a bucket is made of steel, you have to make sure that it isn’t getting rusty or corroded as this will contaminate your horse’s drinking water and can make your horse sick. Plastic buckets should be made of food grade quality plastic so that toxins do not leak into the water from the plastic. You should never leave your buckets out in the weather whenever it is possible to do so, but you will also want to look for buckets that resist the weather so that they last longer. Q: How do I keep the water from freezing? A: There are two approaches that you can use to keep the water from freezing. One thing that you can do is purchase a heated horse bucket that has a heating element built into the bucket that will warm the water. There are also external bucket heaters where you wrap the bucket with the heating element and it will heat the water from the outside in. Both approaches will keep the water from freezing in cold weather. Q: How should I clean the bucket? A: In most cases, it isn’t difficult to clean a horse bucket. All you need to do is use some mild soap and water and sponge to clean out the inside of the bucket just as if you are doing dishes in the sink. Then you need to make sure that you rinse the bucket out real good. Some buckets are dishwasher safe and can be washed and sanitized which you can do if your horse is sick. Q: How often should I change the water in the bucket? A: All living things are sensitive to contaminated water so it is important for your horse to have clean drinking water. In this case, you are going to need to use your best judgment. Generally speaking, the water in the bucket should look clear and it should be free of dirt and debris. So if the water is discolored or it has particles floating in it, then you should change the water. You will also want to change the water if there is dirt on the bottom of it. Q: Why do stainless steel buckets rust? A: In theory, stainless steel should not develop rust thanks to the nature of the metal alloy. However, many stainless steel horse buckets end up developing rust in them. There are a number of reasons for this but one of the main culprits it the welds in the bucket, which change the chemical structure of the metal and can lead to oxidation. High-quality buckets are less likely to have low-quality welds which make them last longer. Q: Should I keep my bucket off of the ground? A: It is a good idea to look for a way to keep your water bucket off of the ground whenever it is possible. When the water bucket is located on the ground, it is likely to get straw, dirt, feed, and other kinds of contamination into the water from the horse moving around. Locating the bucket off of the ground reduces the likelihood that such pollutants will stay out of the water which can keep the water clean.